Morris Commercial van used by the Post Office / GPO in 1934. Homepage. 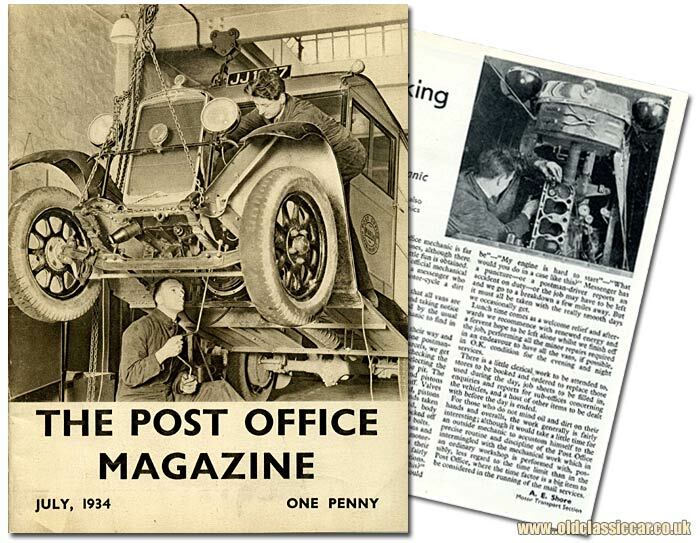 This page: A copy of The Post Office Magazine features one of the GPO vans being serviced in 1934. Post Office (GPO) van from the 1930s. If this publication had been a motoring magazine, it would have gone into the old car magazines section. This copy of The Post Office Magazine, dating to July 1934, deserves to feature somewhere on the site thanks to the cover illustration which shows a Morris Commercial van, hoisted into the air on a chain, being worked upon by a couple of Post Office mechanics. At the time, the Post Office ran a large number of Morris vans, with coachbuilt bodywork as shown below. The registration, JJ 1?57, is a London series as expected for a GPO van, which ran from November 1932 to March 1933. As you'd expect, most of the articles within this magazine relate to the P.O. service as a whole, and aren't in the scope of this website. Fortunately though, a few brief pages do relate to motoring, and specifically the vehicles that the P.O. ran in order to maintain their service. ".. filled up and looking shipshape, and taking notice of dents and bent wings, caused by the usual Mr. Nobody and left for the mechanic to find in the morning". "Having seen the drivers safely on their way and having assisted to squeeze a 14-stone postman-driver into a Morris Minor full of parcels, we get down to real work, starting off by checking the scheduled inspections for the day .... The sump is dropped, connecting rods and pistons withdrawn, and cylinder head taken off. Valves are ground in, the engine decarbonized, pistons and rings inspected, bearings and big ends taken up." 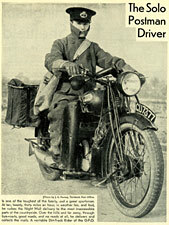 In addition to Morris vans of various sizes, the Post Office also operated Albions, and BSA motorcycle combinations (sidecars), a photo of the latter appears further down the page. Most of a mechanic's daily duties were scheduled tasks, however there'd often be interruptions along the way, maybe due to brake problems with a particular vehicle, or difficulties in getting an engine to fire up. Time each day would also have to be set aside for paperwork. This might be updating the parts inventory, ordering parts ahead of scheduled work, and general reporting back to management. On May 29th 1934, the first regular Air Mail Service within the UK was inaugurated, operating between Inverness and Kirkwall. The aircraft were operated by Highland Airways Limited, from their base at the Municipal Aerodrome at Inverness. A photograph shows the Director of Postal Services, Sir Frederic Williamson, and various dignitaries, stood in front of a De Havilland Dragon Rapide. BSA motorcycle used by the GPO. "The Solo Postman Driver is one of the toughest in the family, and a great sportsman. At ten, twenty, thirty miles an hour, in weather fair, and foul, he rushes the Night Mail delivery to the most inaccessible parts of the countryside. Over the hills and far away, through bye-roads, good roads, and no roads at all, he delivers and collects the mails. A veritable Dirt-Track Rider of the GPO". (Photo by J.E. Pursey of Tavistock Post Office).